Rosalind Gardner is an Internet legend. She has been making money – serious money – for almost ten years now, all based on selling other people’s products. Ros is one of the world’s leading “affiliate marketers” and there is little doubt she knows her stuff; she banks over $50,000 a month from online marketing. The reality is, however, that Ros is one-of-a-kind; in spite of trying, few people are like her. Most people who try affiliate marketing fail at it. Sure, there are other success stories around and many of the leading Internet marketers depend upon their affiliates to bring in the millions. But they will also tell you the reality that the vast majority of their own affiliates fail to sell anything. If you want to make money online it seems so easy. All you need to do is go to an affiliate service, such as Clickbank, sign up for a few products and put the links and adverts on your web site. The money will roll in….not! Like any other sales job, you have to work at it. Simply putting links on your web site or sending out an occasional email to promote an affiliate product will not bring home the bacon. The leading Internet marketers all agree on one thing; even though they have tens of thousand of affiliates selling their products, only a handful of them actually make any money. Most of the income that affiliates bring in to the product owners comes from around a dozen people – even if there are 50,000 or more affiliates registered. It shows that most people who take part in affiliate programs merely add links to their web sites in the hope that they will get a return. 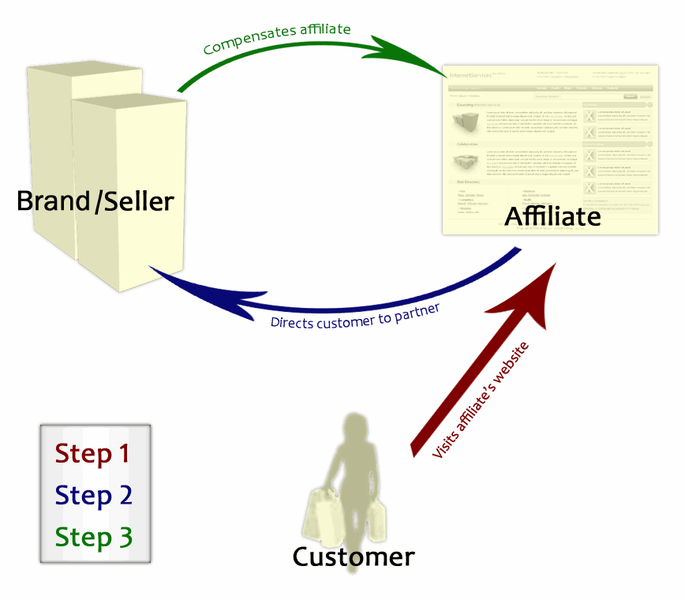 So the question remains, how can you make money from affiliate marketing? And if you are producing your own products that you hope affiliates will sell on your behalf, how do you move beyond just a handful of real sellers? The answer to both these question is the same – work at it. In spite of what you may hear about “easy money” no-one makes real money online without hard work; live with it. If you want to sell affiliate products you need a plan, a strategy, a sales process. Simply embedding links will not work. You need to consider how you are going to sell your products and how you are going to make your offer different to the thousands of other people selling the same material on the Internet. For people running their own business hoping to attract affiliates, they need to think about a complete support programme. Not just providing links and sales letters – but also advice, support and training, just as any company would do for their sales team. Treating “super affiliates” as their very own sales team – with rewards for the top achievers – is the way that the leading marketers achieve their best. It is a mistake to think that your affiliates will be motivated by the potential income on its own. Recognition of their efforts is a much more powerful motivator and therefore if your affiliate program has additional rewards, over and above commission, you will get more active affiliates who strive harder to sell your products, thereby helping your bank balance too. Wherever you sit in the affiliate game, unless you treat it as a “proper job”, it will be a waste of time. In my opinion affiliate marketing is not a waste of time because I learn lots of thing when I start joining affiliate program and it help boost sales in my business and website. Until know I'm still use affiliate as a good method for product promotion. Affiliates are absolutely useless, Citybank never pay up, you do all your homework put in masses of hours for nothing, the only winner is the product seller. Reason is everyone who advertises the affiliate programs with all these get rich plans have completely wiped the process out. Who now you Affiliate welcoming site that give Free advice whilst they make the little left to make out of this dying experience. Find a product, Make your own website, Sell Your Product, If You find a product that sell the customer will find it through basic marketing or basic search. The days of very few Affiliate builders have gone to roost, since Con artist with quick buck making programs such as wealth programs, make money at home earn 1,000-5,000 a month. The world of internet money making schemes in Pyramid Related cover ups. If things are so good, why would you want to tell the world how to do it or use them to create the wealth they supposedly get? We all know People that like to make money will not advertise the so called secret for success unless there is gain, it's a devilish nature that comes with wealth.